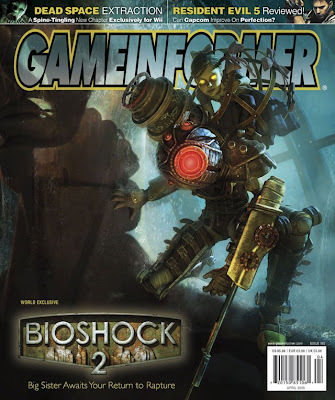 Home » bioshock , bioshock 2 , video games » BIOSHOCK 2: Behold the Big Sister! BIOSHOCK 2: Behold the Big Sister! This blog was already becoming non-stop Watchmen for the past several weeks. Now it's wall-to-wall BioShock 2: Sea of Dreams coverage that threatens to dominate for the next several months. I was working on some more serious stuff when a few e-mails came in screaming about the cover of GameInformer's April issue. According to one report, the Big Sisters are "amazonian version(s) of the Big Daddy, wearing similar, though svelter, gear" and that they will be "faster and sleeker" than Big Daddies. So if you're a fan of the BioShock mythos, you're probably wondering as much as I am right now: where do Big Sisters come from? We already know the story of the Big Daddies and the original Little Sisters. Nowhere in the original BioShock was it ever hinted that there might be a female version of the Big Daddy. Calvin, that made me laugh so hard I spewed Coke on the screen :-) I'd forgotten about all that junk food that's strewn across Rapture. Not to mention the various bottles of wine (beer?) etc. So unless Tenenbaum is eating well from the gardens or is gorging on the rotted meat in the Farmer's Market, her health is gonna take a nosedive from all those empty carbs.